My Waitsburg Cellars wine project has passed some important milestones recently. Most importantly, the wines are out. Four whites, one red, as profiled here on the blog last March. I’ve sampled them repeatedly, and worked the market in Walla Walla, Waitsburg and Dayton, with excellent results. What is especially gratifying is that every one of the wines is somebody’s favorite. There is no single clear winner. That said, I’ve had some good feedback from consumers, retailers, and reviewers. The wines are now being shown to the trade in western Washington, and trickling into wine shops, wine departments and restaurants there. Soon I hope to be able to point you to an e-commerce site, so the wines may be ordered online. Reviews from the Hosemaster, Rand Sealey, the Pour Fool and others have been terrifically positive. The wines will be profiled in an upcoming issue of Seattle magazine, and other national reviews are in the works. As I have written before, this is a huge learning process for me, and very exciting at that. I’ve pulled a few arrows out of my back, but I guess that goes with the territory. 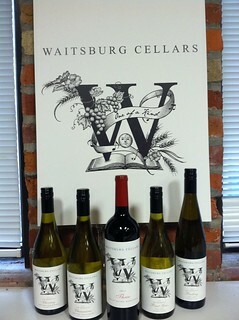 There is a Waitsburg Cellars fan page on Facebook that lists current retail outlets. If you live in western Washington, please ask your vendor to order it for you from the distributor, Cavatappi. I will be working the Seattle market next week and look forward to pouring these wines for you! Looking forward to trying them Paul. For the Three Red are letting sit in a decanter for 12 to 24 hours or in the bottle? Ben, I wouldn't decant for that long - maybe 3-4 hours in a decanter. In the bottle, 6 hours is good, and it will drink well for the next 24 - 36 hours.